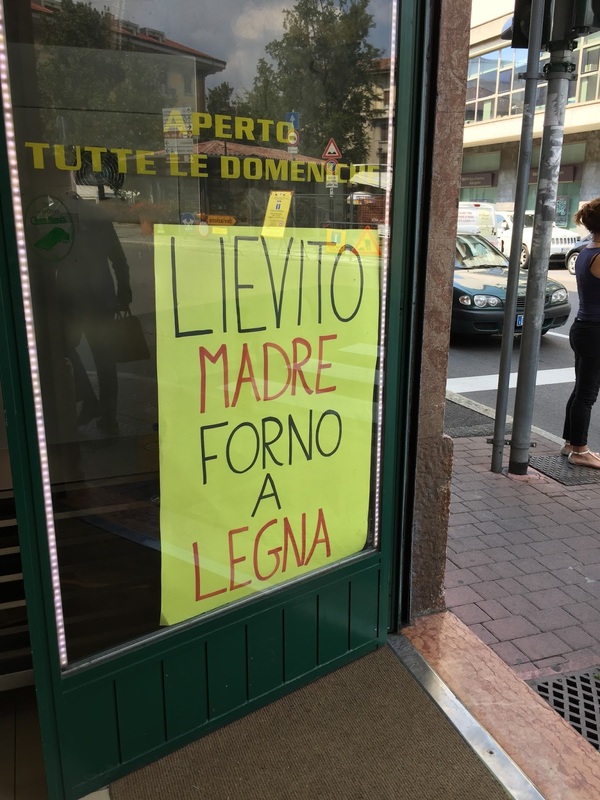 In this installment of Street Sign Language Lesson, we deal with a couple of cases of sic erat scriptum, learn where the best anchovies come from, and find out where to go for a good pizza and a glimpse of an old prison in Bergamo's Città Alta. Left: Broken down car with a I'm sorry note in the window. Center: Condominium warning: put trash in the right bin or else! Right: Anti-vaccination activist who can't spell. Guasta! Scusate – "broken, apologies"
A polite note to let people know that this car wasn't intentionally left in the street blocking traffic without a good reason. But then again, maybe it was just a clever ruse to prevent someone from calling the police while double-parking? La macchina is feminine so it's guasta not guasto. 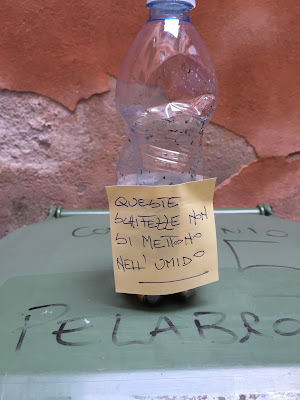 Queste schifezze non si mettono nell'umido – "this crap doesn't go in the compost"
Like the note in the car window above, I especially like handwritten signs. They are more telling and personal than a street sign or official notice. In this case, there is a hint of anger in the note about misdirected waste in our apartment building. We have bins for recycling different materials, be it paper, plastic, glass or umido, which is short for rifiuto umido or organic waste. Not only is it annoying to find the wrong type of waste in a bin, there is also a potential fine for misdirected waste. 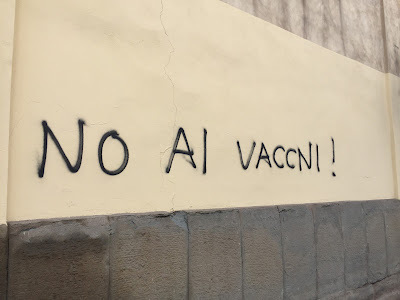 No ai vaccni [sic] – "no to vaccines"
I remember first walking the streets of Bergamo and seeing Atalanta scrawled on the side of building and thinking how silly it was that someone misspelled Atlanta. Little did I know it referred to the soccer team not the US city. Here, this graffiti (on the side of a church on via Pignolo) is truly a misspelling. It should be vaccini. Yes, Italy is in the grip of the scientifically unfounded anti-vaccination fervor as well. Left: Sign indicating that the new flu vaccinations are available. Center left: A brand of grapes playing with the word birichina. Center right: Poster from the exhibition Fame: oggi non so se mangerò'. 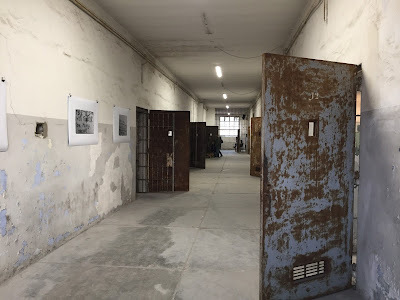 Right: Hallway in the ex prison Sant'Agata in Bergamo. 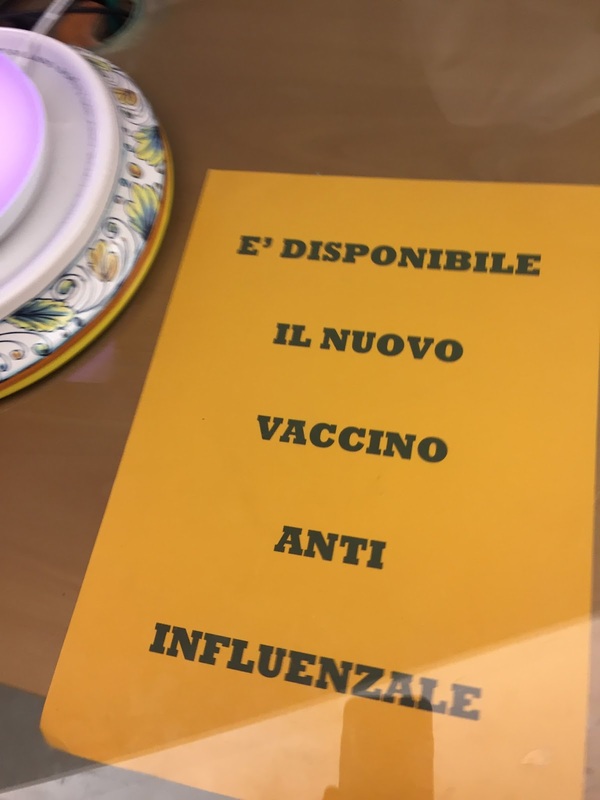 E' disponibile il nuovo vaccino anti influenzale – "The new flu vaccination is available"
In English, we use flu commonly and almost never think of the word it is a stand in for: influenza, which is the same in Italian. Be careful though, because influenza in Italian also means influence. The E' (capital letter e followed by an apostrophe) is a stand in for È. 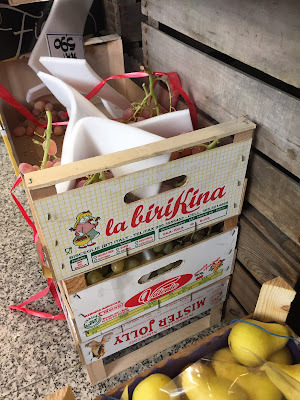 This is a brand name of grapes we saw at our local fruttivendolo. I felt oh so proud that I could recognize this as a play on words. Birichino/a is a little rascal or imp. 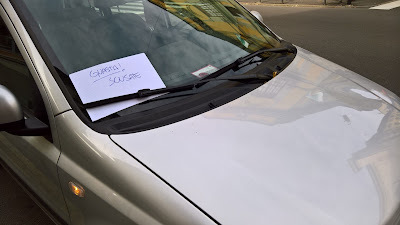 Oggi non so sei mangerò, chissà? 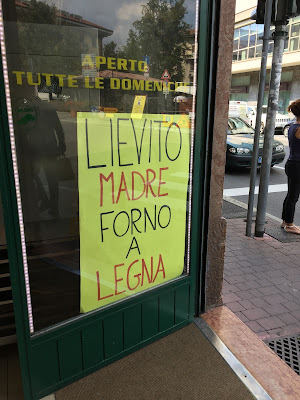 [sic] – "Today I don't know if I will eat, who knows?" 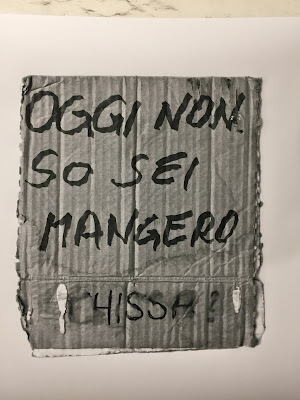 This phrase appears on a poster for the Sabine Delafon exhibition Fame (or "hunger") at the Ex Carcere Sant'Agata in Bergamo Città Alta. 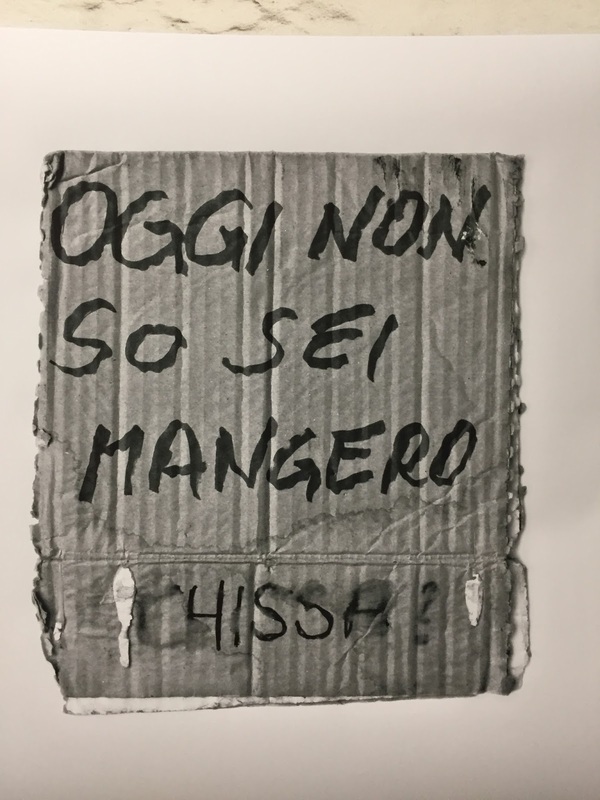 Photographs of signs Delafon bought from homeless people are the subject of this exhibition. The phrase above incorrectly uses sei ("six") instead of se ("if") - the two words sound the same and it's easy to confuse them. I stared at the sign for 10 minutes trying to make sense of it as it is spelled and couldn't. The setting of the exhibition, the ex-prison (carcere), is fascinating. The wall that the Romans built in Città Alta runs along the north side of the building (via del Vagine). The location of the ex-prsion has had buildings on or near it since the 9th century. A convent started up in the 16th century only to be re-purposed as a prison by Napoleon at the end of the 18th century. The prison officially closed in 1978. If you go to the Circolino Città Alta, besides getting a good pizza and dining in a room with a frescoed ceiling from the convent's time, you can also get a glimpse of the prison through the windows. Left: Sign explaining Cantabrian anchovies. Right: Bread made from a starter and baked in a wood-fired oven. 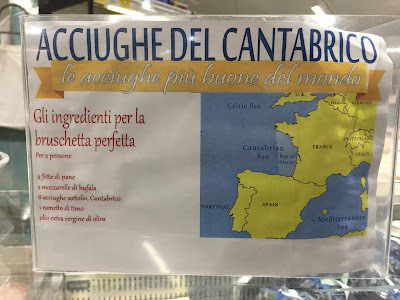 Acciughe del Cantabrico – le acciughe più buone del mondo – "Cantabrian anchovies – the best anchovies in the world"
I like signs that introduce new information to me like this example seen in the fish store Orobica Pesca. Mar Cantabrico (Cantabrian Sea) is the coastal sea of the Atlantic Ocean north of Spain and southwest of France. And now, I also know the ingredients for the perfect bruschetta: 4 fette di pane, 2 mozzarelle di bufala, 8 acciughe sottolio, Cantabrico, 1 rametto di timo, e olio extra vergine di oliva. By the way, English speakers usually pronounce bruschetta as BRU-SHET-TA whereas it's really BRUS-KET-TA, a hard "c". Lievito madre, forno a legna – "sourdough starter, wood-fired oven"
Perfect for the bruschetta recipe above. Note, it's legna, not legno. Legno is wood in general, whereas legna is wood specifically used to burn.